Some of the best recipes are simple…letting the really fresh taste of garden vegetables shine through. This recipe from Practical Produce is one of those. I made just two servings for our lunch, so I’m giving both my recipe and the original 6 servings. I don’t have a cost because everything except the optional bacon was from the garden. I have made this with frozen corn too, and while not as good, it can perk up winter appetites. Sauté pepper and onion in butter until soft. Stir in corn and seasonings. Cover and cook 8-10 minutes, stirring once or twice. If desired, fry 4-6 slices bacon. Remove bacon and reserve 3 tbsp. drippings. Sauté the vegetables in the drippings. Eliminate salt. Cover and cook 8-10 minutes, stirring once or twice. Sprinkle with crumbled bacon before serving. 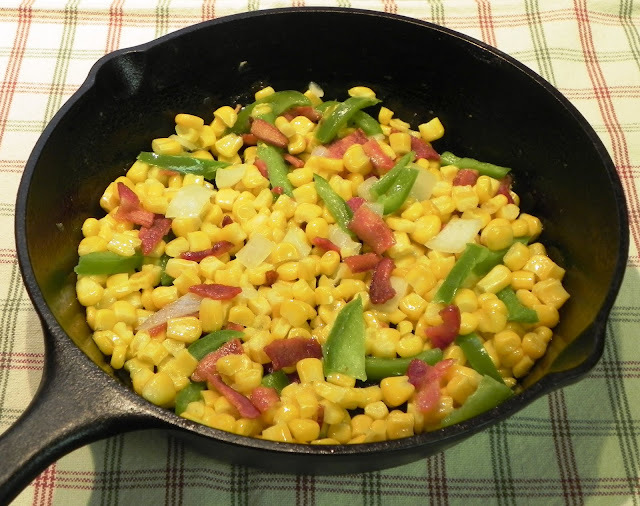 I love both corn and bacon, so a copy of this recipe is stuck on my fridge for immediate use. Your pictures are fantastic, and I am glad I found your blog. Now, I want to read every recipe you have posted, and I may not get my house cleaned today. Heh!